It’s been nearly a year since Pure Luck closed and I still miss it all the time. The only thing that takes the edge off is that it’s not too hard to recreate their menu at home. It’s not quite the same obviously, but works when you’re desperate for a jackfruit burrito. There is not much to making your own, the key ingredient of course being the jackfruit carnitas. So, to make your life a little brighter, I’ve included the recipe below. Generally speaking, I like to make this in my crock pot, because it’s easy to just let it cook overnight, but you could also just let it all simmer for 20-30 minutes on the stove. Heat 1 Tbsp of oil in a pan over medium flame. Add onion and garlic to the pan and saute until the onions have softened, stirring so that the garlic doesn’t burn. Set aside. Break up the jackfruit a little with your hands, separating the flesh (don’t worry too much about the core, it will soften up when cooked). 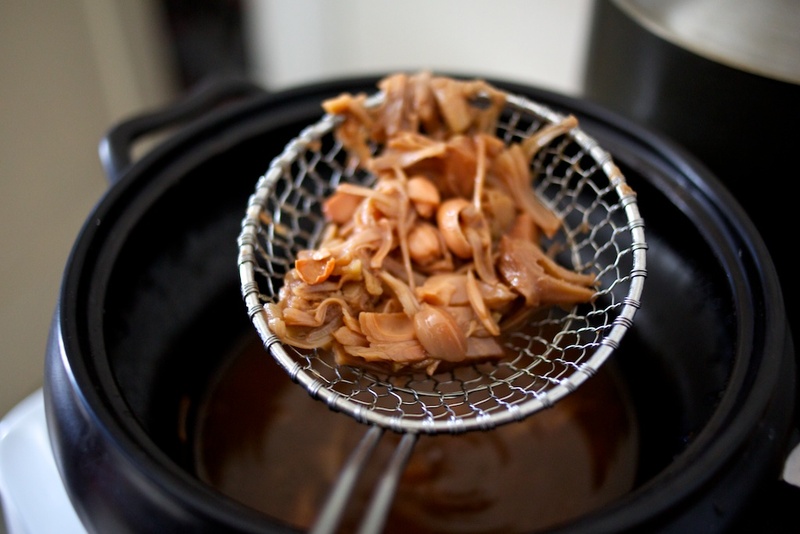 Add jackfruit, cooked onions, garlic and all other ingredients to your crock pot and cook on high for 4-6 hours or on low overnight. You can keep the jackfruit in this broth until you are ready to eat it. In an iron skillet or heavy bottomed pan, heat the remaining oil over medium high flame. Add the jackfruit and saute until browned. You’ll want to break up the jackfruit even more at this point, particularly the cores. 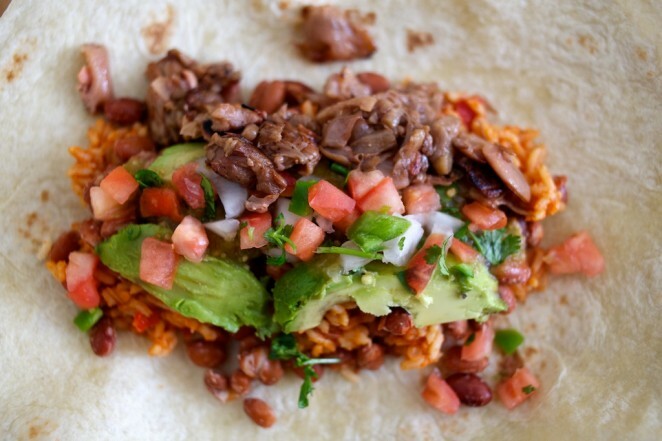 Toss in your burrito and enjoy! The other majorly important side dish from Pure Luck is the potato pals. Someone asked for the recipe to make these, but honestly, they’re basically premade. I suppose you could get all fancy and make some gnocchi from scratch, but that’s certainly not what Pure Luck did. So just pick up a package of gnocchi from the market (make sure they don’t have eggs in them), cook them following the instructions on the package, and then fry them up. I don’t have a deep fryer so, I just fry them in some oil in a skillet. They still taste awesome. Missing the dipping sauce? It’s just vegenaise and bbq mixed in equal parts. I’m still dreaming that one day Pure Luck will reopen it’s doors somewhere else, but until then, I’ll just go on making jackfruit carnitas and potato pals at home. Now if only I could crack their caesar dressing I’d be set. No way- is this THE Pure Luck jackfruit recipe?!?! I miss that place so much… although I’ve heard good things about Plant Food For People’s jackfruit tacos. I miss Pure Luck too! I keep putting off jack fruit experimentation. Love that you add coke(although I might sub some agave and tamarindo) thanks for the inspiration. Mexicoke—genius. 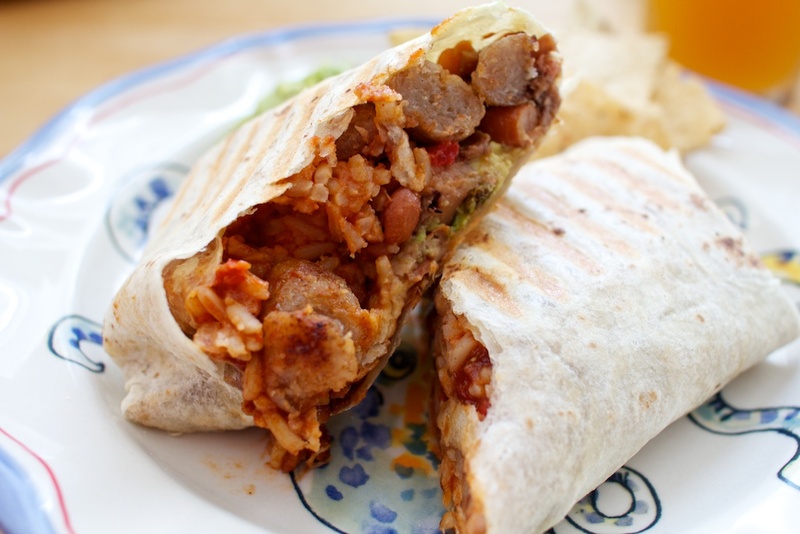 I need to figure out the sauce they used in the Kristen’s Carnitas wrap. I assume it was just vegenaise with some sort of flavoring in it but maybe it was a bottled vegan ranch dressing or something. Regardless, I’m totally gonna try this jackfruit recipe at home soon! Thanks for posting the pot pals! I’ve tried to recreate them on my own, but they weren’t the same. 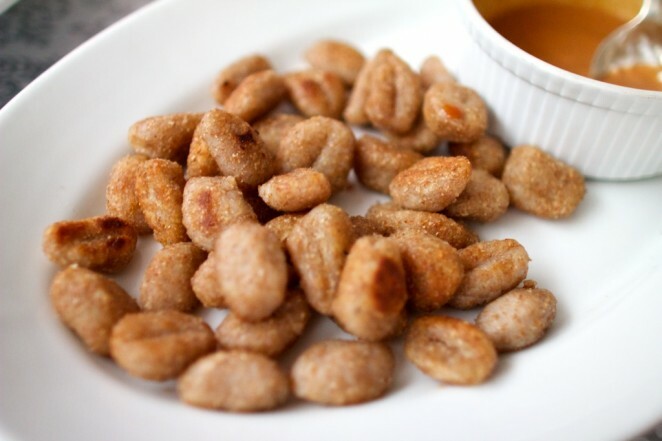 I remember hearing they used Peanut oil for the pot pals, so I may have to try that.